On his 65th birthday, a lonely insurance salesman meets his long lost brother who has built a memory powered time machine. 88 backers pledged $6,463 to help bring this project to life. Part comedy. Part drama. Part faux-sci-fi. This is a post-coming-of-age story about a lonely, disorganized life insurance salesman who experiences anxiety and paranoia surrounding his 65th birthday. His drab, messy office and equally uninspiring apartment is not the future Gray had envisioned for himself. He fears growing older as much as he has anxiety of the past. On his birthday, he experiences bizarre time hallucinations and abruptly leaves work. He confides in is his taxidermy parakeet, Montague, that time is moving backwards. The dead bird is of little help. Amplifying his time perception dilemma, he meets his long lost half brother, Peter, who has apparently built a working time machine that is fueled by memories. The catch is it only lasts for 5 minutes at a time. Gray volunteers and enters the memory time machine. We revisit his birthday three years prior, the day his wife left him. Gray watches his life on a TV screen before he is ejected back into a harsh reality. However, not everything we've seen is to be believed. Gray discovers a truth about himself in an elaborate scheme of lies. This is 20 minute short film that adopts the feel of a feature. Production will begin in the beginning of September with plans to shoot with the Arri Alexa, an amazing high-end camera that is able to achieve a filmic look. Production is set near the end of August. Cannes Short Film Corner, Toronto International Film Festival, SF International Film Festival, Raindance, Göteborg Film Festival, Venice International Film Festival, Palm Springs Film Festival, Mill Valley Film Festival, SF Shorts, Sedona Film Festival, Brooklyn Film Fest, SXSW, Sundance, Tribeca Film Festival, Berlin International Film Festival and more to come. The short will of course be visually striking and aesthetically intriguing. With choreographed camera movement and doses of visual effects sprinkled throughout, a sense of magic is inserted in the realism. Costuming, props, set design will intensely art directed with a consistent palette. In addition to the unique visuals, the film will also have an entirely original score by Stephanie Lin! 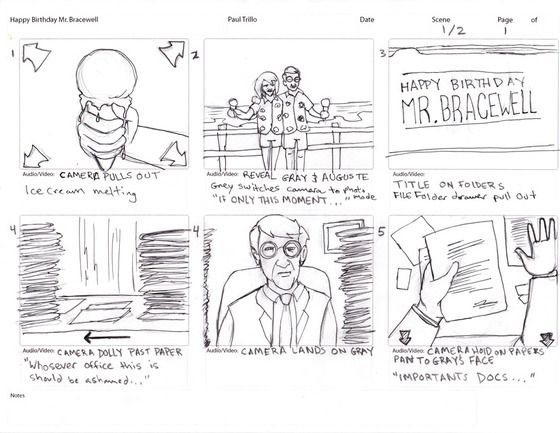 UPDATE: THE FIRST FEW PAGES STORYBOARDS are up for viewing. UPDATE: Backers of $25 or more will receive the following poster in addition to other rewards. 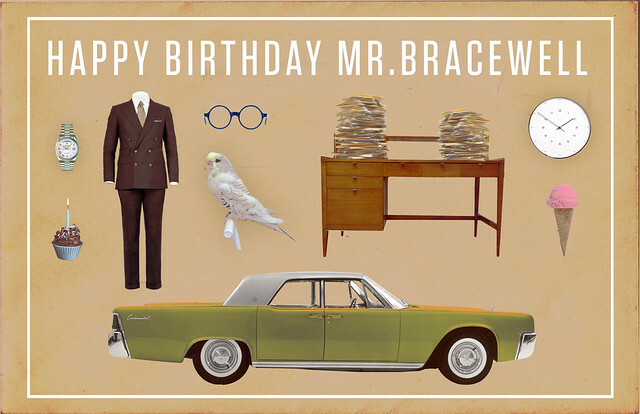 Be sure to check out the Happy Birthday Mr. Bracewell style guide and for more on the look of the film. This is our big cost. The Arri Alexa is an amazing camera and therefore comes with an amazing fee. We will also be renting various dollies and jibs to enable a range of shots. We know we won't be paying for a Brad Pitt but we'd still like to compensate professional actors with some amount. We are building a time machine so naturally we want it to look awesome. The sets will also be heavily designed with furniture and retro props. A minor cost but still necessary for a polished color correction and visual effects. Béla - following a street performer and his cats. Shot and premiered at the 2011 Cannes Film Festival. A Vimeo Staff Pick. How To Fly A Kite - originally made for the 48 hour film festival about a one man cult. Screened at the Cannes Short Film Corner, SF Shorts and Vimeo Staff Pick. My shorts and music videos has played in various screenings, festivals and been featured on major sites including Vimeo Staff Picks, MTVHive, Pitchfork, Short of The Week, Marvel.com, TheDailyWh.at, Buzzfeed, Dlisted, Comingsoon.net, SFWeekly, LAWeekly, The World's Best Ever, The Curious Brain, Yello!, The Fox Is Black, Change The Thought, NOTCOT, ProxArt and many more! More work can be found at The No Problem and AJG1985. A memory that will last forever. Plus an exclusive first look at the film before it is sent off to festivals! Script is available upon request. Receive a birthday card on your birthday featuring an illustration from the film. A DVD of the film and a personal birthday card with one of the illustrations from the film. A night of good rest knowing you contributed to an awesome project. DVD and a cast signed birthday card. Also your named featured in the credits! Bragging rights as well as the ability to see five seconds into the future. Previous rewards and your name featured in the film! Not just in the credits but visibly written somewhere in Mr. Bracewell's insurance office. Your name may appear on top of a stack of papers, in a filing cabinet, on a post it or on a computer database as a client of Bracewell's Life Insurance. The ability to travel back in time if you close your eyes and think hard enough. Have a birthday coming up? All previous awards for two people. Two cards, two DVDs and two names in the film. Plus we will make a personal "happy birthday" video with song and message for you or the person of your choice and sent on that special date! Plus credit as junior executive producer. An Executive producer credit and advanced viewings of the film to watch it's progress. Also an invitation on set to ride in the time machine!